Greenhorn Erin Bullock of Mud Creek Farm just got a shiny new tractor! It’s that time of year. You can read about it on her blog, http://www.farmererin.blogspot.com/ And in the meantime, here’s a sneak preview. Well, I’m buying a new tractor. The first tractor I’ve ever actually owned. Brand-shiny-new, and orange. 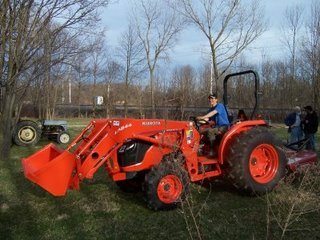 The local Kubota dealership was kind enough to bring it out to the farm, let me hook up a borrowed plow (thanks to farmer Jack down the road), and give her a spin. I needed to judge for myself how well it would handle a pretty large (16″ moldboards) 3-bottom plow. We tried it out on Jack’s land, since that’s where we picked up the plow– in 4-wheel-drive, 3rd gear, with the plow lifted up halfway so the depth was shallower, it had no problem doing a sufficient job of turning the sod over. No problem except the plow was too wide for the width of the tractor. This resulted in 2 1/2 furrows instead of 3. A half-turned over row of sod does not do a great job at killing the grass– it will just regrow. I will have to look for another plow, because I’ve fallen in love with this tractor.